In the hopes of learning and understanding all the recent recommended diets, I would like to give my opinion on the content and the food suggestions of a following series of books. In Eastern Medicine we believe diet is the first level and most important when understanding a patient’s constitution and illness patterns. 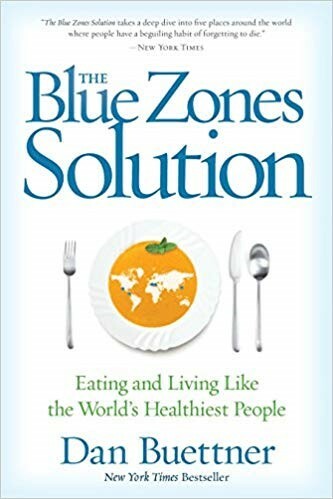 The book I would like to cover in this blog is The Blue Zones Solution written by Dan Buettner. The book identifies 5 locations around the world where people live longer and with less disease processes. I personally was interested in this book because of the lower levels of dementia. The basic idea is to eat less animal products, more vegetables, fruits, legumes, nuts, seeds and some grains. I feel the dietary suggestions made are responsible and reasonable. Nothing is eliminated but if you eat the provided recipes you will not want to eat unhealthy food. The second thing the book discusses is exercise. In America we do not spend time walking or working the land as much as in the past. We live a sedentary lifestyle and then head to the gym to work out and burn calories. The book suggests more walking, working in garden/house cleaning and not necessarily one-hour extreme workouts. I love this idea of staying healthy by walking however I think if the one-hour workout works for you then it should not be discouraged. Any form of exercise is beneficial so please keep moving. Lastly the book address community involvement and having a group of individuals (moai) you interact with regularly. By belonging to a community people feel needed, respected and heard which leads to longevity. I highly recommend this book and the food recipes provided. Remember to monitor how you feel with any changes to diet and exercise.